One of the unfortunate ways many people have of addressing a negative situation is to identify the person allegedly responsible for the situation so that blame can be assigned. I find this to be a most unfortunate impulse, since so many life situations that occur do not require, nor do they benefit from, the identification of a culprit by a blame-focused individual. Many people report having grown up in a “blaming environment” or a “blame-oriented emotional atmosphere.” This suggests a parental or family focus on discovering the culprit involved in a wrongdoing so that he or she can be punished for the transgression committed. There are times, no doubt, when this is necessary and appropriate; occasions where a wrongdoer must be identified and attended to. Examples might include such occasions where carelessness leads to a dangerous situation. There are times, however, when a situation does not require the identification of the offender, particularly when the offense is inconsequential and could be handled by the person discovering the offending act. One patient reported his childhood home atmosphere as one in which any minor infraction—leaving a room without turning off the light, leaving the cap off the toothpaste tube, or forgetting to put a dish in the dishwasher—would lead to a “parental witch hunt” for the responsible culprit. Often, an environment like this one breeds a blame mentality wherein many behaviors are viewed as justifying criticism and punishment. Blaming is an unfortunate occurrence often observed when working with couples. 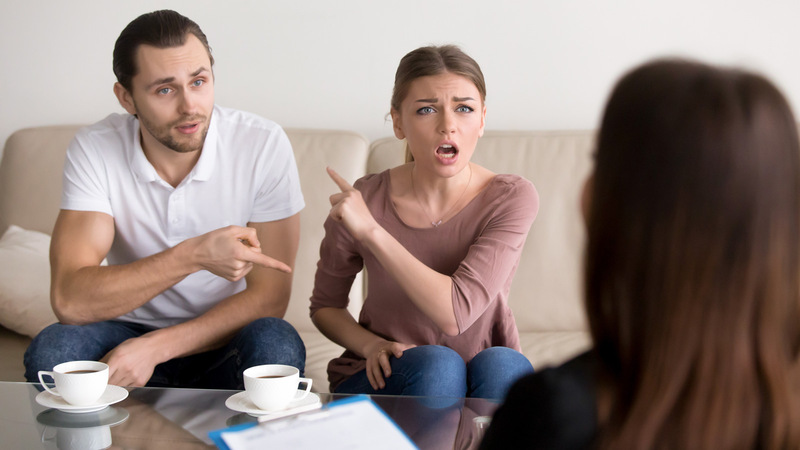 At times, one member of the relationship is perceived—rightly or wrongly—as “guilty” of some wrongdoing and, therefore, deserving of blame for the alleged offense. One problem with blaming is that it tends to undermine what otherwise might be constructive communication that could lead to better understanding and meaningful change. Another common problem is that the blamer often avoids a necessary self-examination to determine his or her own responsibility for a problem or wrongdoing. When Paul blamed his wife, Martha, for his sexual affair with a colleague, he felt justified and managed to absolve himself of any responsibility for his transgression. “It’s what guys often do when they’re not being satisfied at home,” he asserted with self-righteous indignation. The first time he was helped to look at his own responsibility for his behavior was when he was asked to ponder the question of why not everyone chooses to handle that problem by having an affair. The purpose here was not simply to shift blame on the person whose behavior impaired the marriage. It was to have Paul take responsibility for his own actions and not blame Martha, thereby justifying his own unacceptable behavior and absolving himself of any wrongdoing. With help, Paul was able to examine his motivation for his extramarital affair. He discovered that he had actually used his dissatisfaction in his marriage to justify doing something that he wanted to do anyway and might well have done regardless of whether or not he was or was not a satisfied husband. Another consequence of what I call a blaming mentality is self-blame, especially when there appears to be little or no justification for it. Many people rush to judgment against themselves without a full examination of the justification for such self-indictment. This propels them into significant emotional distress and often requires professional help. There are certainly circumstances and occasions when leveling blame at someone else or oneself is fitting and reasonable. One needs to be very careful to differentiate between justifiable and unjustifiable blaming, as well as to have a reasonably forgiving attitude when this may be the appropriate response. An updated version of Blaming is included in my new book, Help Me!. More information, including the table of contents, reviews and purchasing information is available on the Help Me! page.